Get a matching set and save! 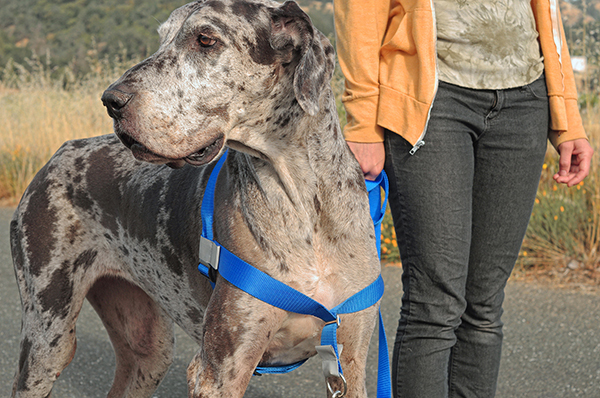 Traditional 6 foot long leash in matching color. The leash attachment is a tough nickel-plated steel ring, 50% thicker than lightweight rings, and welded for increased strength. You can count on the same durability in the front slider. We heard about this product from our neighbor. We love it for our 180 lb Mastiff, and getting another for the new puppy. We tell neighbors, friends, other large breed owners; even our breeder got them for her Mastiffs on our recommendation. You've got an excellent product here. 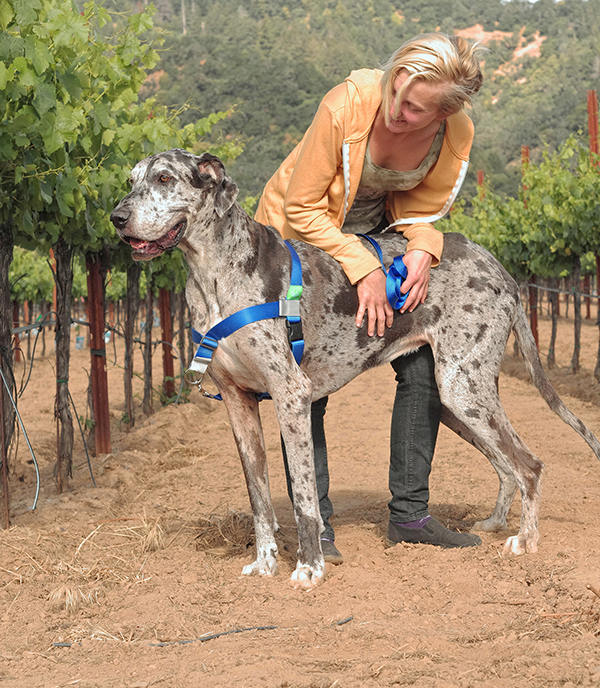 I always recommend your harness to my fellow giant breed people because it’s such a great harness, I will be happy to add what a great company you are to stand by your products. I’m Mom to 2 large and 1 extra-large dog, all rescues! I have a Neapolitan Mastiff who weighs nearly twice as much as me and after battling with collars and harnesses and making life very stressful for both of us someone recommended this to me on our local park. Never have I experienced a change like it, my back no longer aches and my shoulders feel like they are in place when I come home!! it’s like I've got a different dog on the lead! Also delivery to the UK was faster than expected, very impressed. Thank you so much for creating this product it is a god send! If I could give it 10 stars I would! We just used our new broadband harness on Andra - our Anatolian Shepherd - for the first time and it is wonderful. She has been able to escape all other harnesses we have tried but not this one. She tried as soon as we turned our back to her but soon found it was pointless and hasn’t even tried to get put of it again. It is also so easy to put on and adjusts to fit her very nicely I highly recommend this harness. I have purchased a broadband harness for my 95 lb Alaskan Malamute and its been great. I DO like the design and quality of what I’ve seen. It is much better for us, I get the concept. I have a Leonberger and have the Harness for Giant Breeds... great fit and my big guy likes it!! 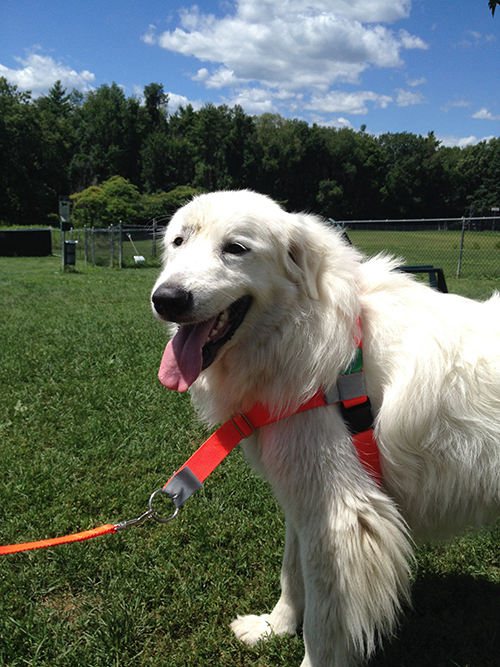 This harness has been a game changer when walking Daisy our 2 year old Great Pyrenees. She constantly pulled hard and would drop anchor on interesting smells regardless of how she was connected to me. She also lunged at other dogs and cars while walking. My back and shoulder were not tolerating taking her out. The Broadband fits her well and she gives me a slack leash now. She still drops anchor on the smells, but it's easier to get her to come along with me and the lunging has dropped off significantly. We both are enjoying our outings a lot more. Now if you can come up with something to stop her from constantly circling me while we're walking I would buy it in a heartbeat. This is the best dog harness I am so glad that I ordered this. I received it within just a few days of ordering. our first outing was to Lowe’s , tractor supply and Sportsmens den which are all dog friendly stores. The worst part for my dog is walking across the parking lot to the store cars noise and he gets frightened and wants to pull but absolutely no problem with this harness. Just ordered one for our Pyr pup who was pulling my husband down and it worked from the 1st use. Easy off/on and Kodi stands politely while we put it on him. WONDERFUL! 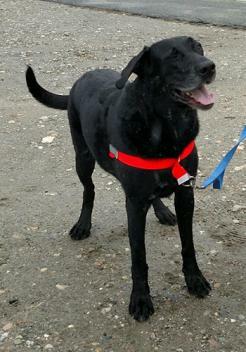 Now going to get one for our older, larger Lab (Tank) since even the pronged collars don't control him without pulling. LOVE THE PRODUCT!!!!! This is the best harness I've tried. I have a 110 lb Shepherd and he was always dragging me. I just took him out and he walked beautifully the very first time. It has really made a difference with training this BIG dog. We got Sadie one, its super! Sadie is 155 lbs. Works great no more collar around her neck. We already have 2 harnesses for our 2 adult dogs and just purchased another for our puppy. The best harnesses we have ever used for our Akita's who used to pull like crazy. Will not be using any other type of harness from now on, definitely a life changer for those doggie walks. Our 120lb German Shepherd, who is usually free to walk unleashed in our fields, was difficult to walk on leash - he would pull and, worse, 'wander' in front of us and we narrowly escaped being tripped up several times. But today we had our first walk with his new harness and it was dreamy. He stayed on the side of the road and adjusted his gait to mine (kinda slow for him!) and didn't pull once. He seemed to be able to feel what I wanted him to do with the slightest touch and I didn't open my mouth once. We have a GSD puppy coming in March and you can be sure we'll be ordering another harness for him. Thank you for good customer service and thank you for being easy to deal with. I rescued Bronte from a breed rescue club in the UK and she has had behavoural issues but we are getting through them now and after reading your website it would seem that you want to put the dogs first as well. I have told the coordinator about your products and also posted my experience on a couple of Newfoundland forums. 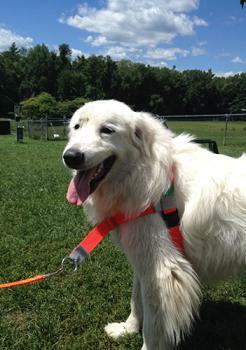 Wilbur is a 120 lb white golden and he and I could not be happier with your awesome Broad Band Harness. We have tried so many different store bought XL, XXL and XXXL harnesses, and this one finally fits and is comfortable, easy to adjust and put on, and doesn't pull on any part of him at all. We are thrilled!! He's a little... heavy... and broad in the chest and nothing else fits without pinching or restricting his walking. As the goal is to increase his exercise and decrease his mass (although, to be honest, he's always been a big boy) this was a problem. Tonight we walked and walked and he didn't pull, hesitate or seem in any way restricted by the harness. And it's so bright and reflective it can be seen from neighboring states! 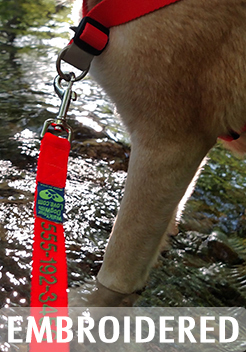 : ) Thanks so much for making such a great product, I'll be recommending it to all the big dog owners I know! We have a VERY strong, small on the inside, 100# Bernese Mountain Dog, “ Bear Dog”. This harness is the ONLY way to not get dragged down the street until he gets to run in the open fields. I literally tell EVERY one who asks the same thing and this is the BEST. This is the ONLY thing that works!! We have a 135 lb Newfoundland/ Standard Poodle mix and he loves his walks. We took him to obedience school so walking him would be an enjoyable experience for both dog and human... did not go as planned! 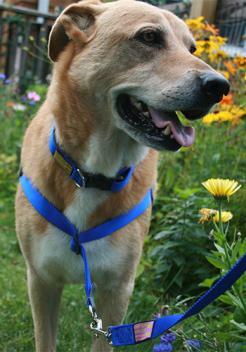 Jake's excitement to meet new dogs and people made walking him a terrible dragging embarrassing chore. We tried training collars, harnesses, the head harness and the list goes on. 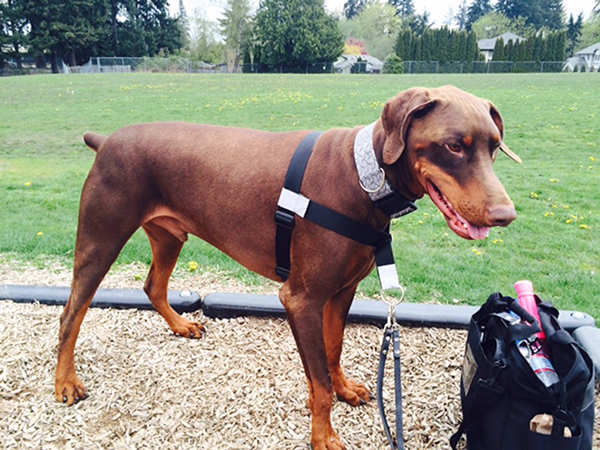 I stumbled across the Broadband harness made for big dogs and wanted to give it a try. SO HAPPY with this harness!! It truly gives myself and my husband security knowing it's durable and made for big dogs. It is not flimsy, it fits perfectly and is so simple to get Jake into. My husband enjoys his daily walks with our big brute and Jake is a very different happy dog while walking. This product is a definite 5 star!! We absolutely love the harness. It completely solved his pulling issues. He is so easy to walk while using it. When we walk him with a standard harness he would drag me everywhere! You would think he was a sled dog! Zeus is an 11 month old 100 pound German Shepherd by the way. I just got one for my Pyrenees. Got the largest size to be on the safe side since he already weighs over 125 at barely a year old. I have less pulling with the harness than a training pinch collar. I am a customer of yours and love your products for my great Pyrenees cross lab. I have 3 of the broadband harnesses and love them. This harness is really great for my big dog.She responds well, she is usually pretty mellow, but i think it is more comfortable anyways. If it came in pink camo I would be really happy. Best walking harness ever !! "Thank you Walk Your Dog With Love " I have a beautiful sweet 7 year old, 93 pound pit/mastiff mix, she is very strong, I'm 70 years old so she was a handful when we went for walks, it for sure was not fun. Since I put the harness on her walking is a pleasure, we go to the park and we walk in my neighborhood . I have full control and walking is fun again. Thank you. My dog is very large, polite on the leash, but strong. She is comfortable in this harness as it is built for her size. It is great quality and has held up well. I like the wider material and bigger latch. The fact that you can have the harness pretty loose--and still have it stay on the dog and work so well--is a fabulous feature!! My gigantic fluff ball (Great Pyrenees) won't tolerate anything tight--he chews himself out of it or sits down and refuses to budge. I made your harness nice and comfy for him -- and he walks easily with me, and no longer tries to escape by twisting around and backing up and all that silliness--because he just can't get out of it!! Best design ever. Just received Hudson’s new harness and I am thrilled that it works. 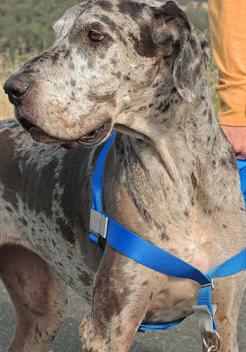 OMG I am annoyed with myself that I waited 8 years to find something other than a pinch collar to walk my super friendly, puppy-like, strong Great Dane. He was so good that I can’t believe it. He is 8 years old and finally found something that I can control him in case an animal runs by or anything that might excite him. I am shouting to all my friends on Facebook. Thank you for the BEST harness for dogs. 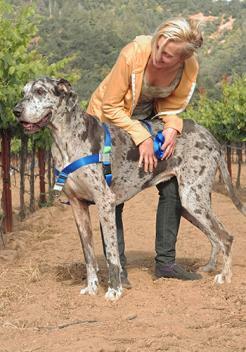 I use it for my dog who is large breed and have recommended it for others with large breeds. They have also been using it and it is great. I also walk dogs and have passed it on to some of my owners, some of which have purchased, too. I have been with my Bart since puppyhood. He is a 150 lb teenager that has been impossible to walk. Bought the WalkYourDogWithLove harness and leash and what a relief! We can walk and I am in control. Thank you for being so kind to me when I called. You have a great product and I will spread the word! I like the harness because it is so easy to put on. Buddy is an 8 month old Newfoundland. I am using this now. My dog likes this much better. These harnesses are simple and quite amazing! They will guide rather than pull on the dog's strongest part of his body his neck and chest. Pulling on their necks just doesn't work but this harness did very quickly and very simply! Try it! I got 1 for my male Cane Corso. He was very unruly with walks. It works very well, so well in fact I got a second one for my female too. I've tried several no -choke - no-pull harnesses which did not work. THIS one is the only one that does exactly what the video says it does! I want to give you a big shout out! I was on a social media site and saw your ad. I was about to have major surgery, and at the time my fear was not being able to walk my 95 lb yellow lab for weeks because he walks me, not the other way around. I have tried other non-pull collars with no luck. I received this collar two days ago and finally took the time tonight to watch the video of how to fit it. I put it on him, and he was fine. Then put the leash on, and stood there scared to open the garage door for fear he'd pull me too hard and hurt me. But as the door went up this time something magical happened! He stayed right next to me! We walked down the driveway, and down the sidewalk a bit, and OMG--no pulling! In fact, he stayed by my side! It was like my dog was replaced with another more obedient one! I can't thank you enough! I am overjoyed with my purchase, best money I've spent in a long time! You guy's are angels in disguise! Thanks so much! So happy I saw your ad! Best best best harness ever! Received our harness today! Posted a pic of your business card on my FaceBook because I know that this product works. Bringing your business cards with me to my vet next week. He really needs to start recommending this harness for his clients! The ONLY WAY TO WALK YOUR BIG DOG !!!! Not on the neck, not on the back but under the chest. Works! Thanks for your email and the supporting videos. I understand now what you meant by "scooching"!!! Everything is working well and I'm really impressed!!!! I feel like my dog is also enjoying our walk more! Thank you for the good job!!! This product works pretty good.I have a Great Pyrenees, and walking her has become a pleasant experience so far.Only had it for 3 days, but so far, so good. Have one. Love it! Has really stopped our dog from pulling. Much more peaceful walks! Just wanted to let you know I have received my harness and it fits perfectly. I can't thank you enough for all your help with sizing etc. I tell everyone with a dog about this so hopefully they will buy from you. They really are great for great big dogs!!! WOW! Me and my husband used these harnesses for the first time on our 2 German Rottweilers this morning. BEST WALK EVER!! Our male dog (Rex) was a bad bad puller and I was always worried he would end up breaking his neck (or mine) as he is a big dog pulling me. But today he walked very good and happy instead of choking and stressed, I couldn't believe it. He didn't struggle when putting the harness on him, although I was sure he would because he would always jump and go crazy when we tried to put a collar on him, but this harness is like magic! 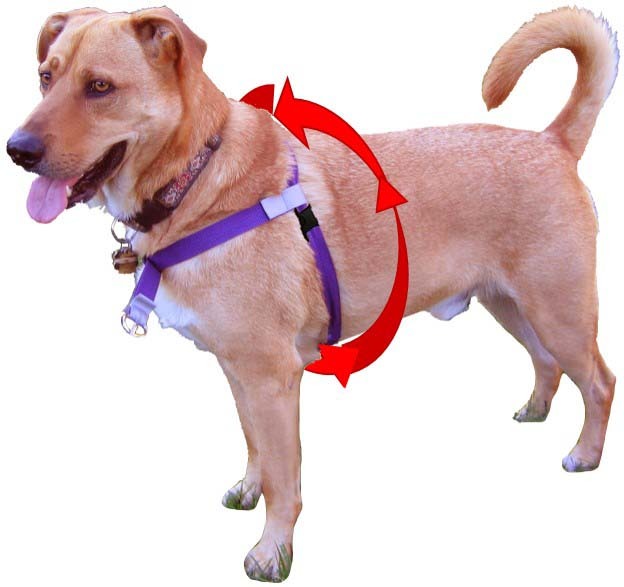 I am going to recommend this harness to my family and friends who have dogs, because today was the beginning of many many happy and loving walking experiences with my dogs. THANK YOU!!! Hard to believe the hundreds of 5 star reviews - UNTIL you put it on your dog. You then think it won't work. SURPRISE - it does. 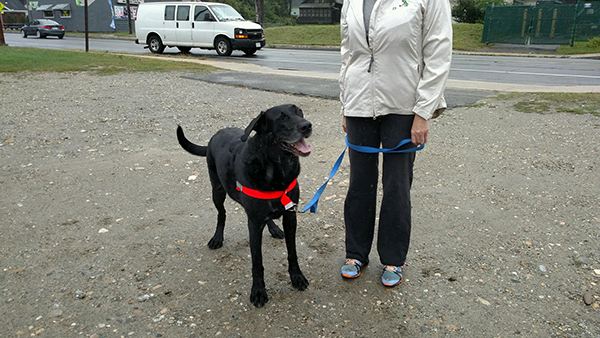 My young boisterous black Labrador walked calmly beside me almost right away. I was astounded and so was he. I'm sure he was trying to say - I like this !! He has now progressed to the wider sports one as he is a big lad and it is such a pleasure to walk with him and I know he will behave when we walk along the road. I have recommended to several owners I have met on my walks. One time - meeting a couple trying to walk a very unruly Labrador straining on a choke lead - they apologised for her behaviour. I offered them my 'harness'. They said they had tried everything - !! I put it on her and her owner gently led her away. Again not believing it was possible. They have one of their own now and I meet them occasionally- she is very well behaved now. There are several others now ' walking their dogs with love' now. I gave the first one I bought to my local vet. They commented on how good it I was to see my Kylo walking gently beside me. THANK YOU FOR MAKING MY WALKS SO STRESS FREE. So simple and amazing - it is worth it's weight in gold!! I love this dog harness!! I can finally walk my dog without her pulling and choking herself!! After having tried many "anti-pull" devices on my dogs over the years I can honestly say these are by far the best. Fantastic customer service too, a big thank you to all concerned. I have one and use it. Love it. We have one....best thing! Big dogs don't pull anymore. I couldn't walk my dogs without these. I just wanted to say how happy I am with your dog harness. Are you sure there no magic woven into your product!!! I have a beautiful, good-natured rescued Lab cross with German short haired pointer, I have had him for 2 of his 8 years on this Earth, I had given up on lead training and spent a fortune on harnesses and head halties, to no avail as each seemed like somewhat of a personal challenge to Ash, I had even embraced this by embarking on canicross and park run with Ash (yes, perhaps it's cheating having a 43 kg dog dragging you around the course!). As soon as I put the walk your dog with love harness Ash was so different, no more pulling, aching back or arms, a truly wonderful product. I Had to tell you what a wonderful product your dog harness is. I have a 106 lb. male Malmute and 56 lb. female Husky. I cannot tell you how much my walking experience is with this harness. I fell off a ladder about a year and one-half ago and fractured my pelvis and I have not been able to walk them until I received your harnesses. Both of my fur babies pull like they are in the Iditarod. This harness has been a lifesaver. I have total control over both of them when we walk, no pulling, and all three of us are enjoying our walks. Thank you. I am in love with the dog harnesses that I’ve ordered from Walk Your Dog With Love. Good morning USA! I just wanted to let you know that I received your dog harness and I'm pleased to say that my girl doesn't pull anymore. I can only walk at a certain pace as I have had a hip replacement. I think I have adjusted the harness correctly but all in all it is the best one I have tried so far. She is a big girl and weighs about 38 kgs (approx 84 lbs) I'm looking forward to receiving the leads and the car harness attachment. I will definitely spread the word around with my friends. I just received my dog harness in very good time, thank you for prompt delivery. So far all the instructional videos have been very easy to understand and I believe it is properly adjusted to my dog. Thank you for so many instructions and very prompt delivery !! Very pleased so far . Bought this dog harness about 1 year ago. Made a 95% improvement in leading/walking our Pyrenees. Great Product. Got the new dog harness and it's WONDERFUL. I loaned it to the gal I adopted Khaos from. She also has K's father. And she has some herniated disc issues that make walking a big dog that pulls pretty painful and not fun for anybody. She's sold and will be ordering a BroadBand harness from you as well. I sent her the link to the website. I just wanted to let you know that I received your dog harness and I'm pleased to say that my girl doesn't pull anymore. I can only walk at a certain pace as I have had a hip replacement. I think I have adjusted the harness correctly but all in all it is the best one I have tried so far. She is a big girl and weighs about 38kgs (approx 84 lbs) I'm looking forward to receiving the leads and the car harness attachment. Many thanks for your dog harness; I purchased one of these harnesses recently and I am very pleased with it; my dog is far easier to control. Truly amazed. We have two 85 lbs Golden Retrievers (1 1/2 years old). Last night was our first walk without being pulled. Highly recommended! Thank you. My husband showed the video to his brothers yesterday and they already placed orders. Again the dog harness is amazing. Another nice walk last night! Great Harness! My cattle dog actually acts half way normal when she is wearing it!! So I figured I would surprise my sister with one after she told me her Australian Shepard pulls on the leash like crazy.